In the early 1920’s the Fort Wayne Rifle and Revolver Club attempted to make use of Franke Park but this quickly ended as it was determined to be too hazardous in the summer months. A neighbor of the park was asked to remove his cattle from Franke Park before a Labor Day picnic in 1923. An Anti-Tuberculosis Christmas Seal Camp which operated for 18 years, ending in 1945. In 1939 a small man-made lake was created. It was used for ice skating, ice skating derby, and the Fort Wayne figure skating club in the 1940’s. Winter carnivals were also held in the park in the 1940’s. The Boy Scouts wished to hold their annual Camporee in 1944. The Fort Wayne Women’s Casting and Conservation Club wanted to get involved by suggesting Post War activities and improvements. There was a request from Northside High school track coach in 1939 to use dirt areas as tracks. The National Guard Units consisting of 300 men used the park for seven days of field training in 1939. Around 1946, there were also donations for the pond of ducks and 3 swans. Two flew away and never returned and it was decided that the future swans would be donated to St. Francis College. In 1952 a Bird and Wildlife Sanctuary opened to the public and Fred B. Shoaff donated 54.36 acres to become part of Franke Park. In 1961, fifteen flowering Japanese cherry trees were donated to Franke Park by the International Christian University of Mitaka-Shi, Tokyo, Japan. 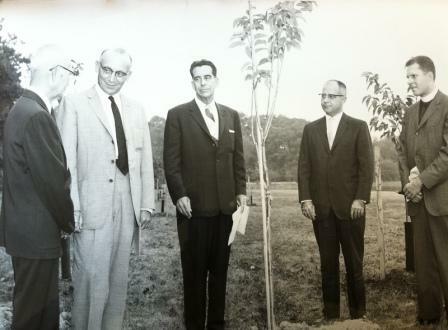 The trees were a symbol of the tenth year of the friendship between Fort Wayne and the University. In 1972 the Nature Lodge in Franke Park burned. In 2002 after extensive negotiations the Franke Park parking lot expansion was completed, adding approximately 600 new spaces for park and zoo visitors. Since its inception in 1946, Franke Park Day Camp has provided unforgettable childhood experiences for thousands of Fort Wayne area youth. 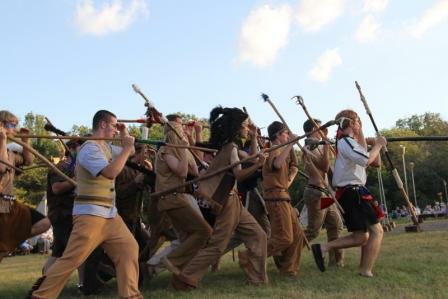 With its strong emphasis on nature education, basic camping skills and Native American Lore, Franke Park Day Camp provides an environment which fosters cooperation, problem solving and socialization as well as the dirty, muddy, outdoor fun kids of all ages enjoy! In 1988 the program was extended to include 4-5 year olds. Franke Day Camp was presented with a Citation for Excellence from the Alfred Adler Institute of Fort Wayne in 1996 and is the Fort Wayne Park and Recreation Department's longest running children's program. The camp is celebrating its 71st season this summer. The Foellinger Theatre in Franke Park was constructed in 1949 as a gift to the community from Helene Foellinger in memory of her father, Oscar Foellinger, former publisher of the Fort Wayne News Sentinel. The Theatre was to provide a unique type of entertainment space - an informal, open-air community gathering and performing area, set in a grassy hillside in the park. A fire in 1972 provided an opportunity to make major improvements to the theatre. The reconstruction started in 1975 and in 1976, the present open-sided dome and a new stage house were added through the generosity of the Foellinger Foundation. The theatre seats approximately 2,500 fans. In 1994 renovations included new seating and a new electrical system; funding provided by the Foellinger Foundation. A grant of $200,000 was provided by the Foellinger Foundation and the Theatre purchased a new sound system. 1999 marked the 50th anniversary of the theatre and another grant from the Foellinger Foundation providing better sound and lighting equipment. Various improvements have been made to Foellinger Theatre throughout the years. In 1964 the Jack D. Diehm Museum of Natural History was donated and constructed. The museum offered a variety of mounted fish, fowl and other mammals which provided an excellent educational space for nature study. In 1980 Diehm Museum was lost to a fire and reconstructed. In 2011 the Diehm Museum was officially closed. In 1952, 54 acres were added to Fort Wayne’s Franke Park to establish a na­ture preserve. At that time animal displays included four monkeys, a black bear, three wild­cats, deer, mountain goats, raccoons, foxes, porcupines, pheasants, ducks, swans, and an American eagle. On July 3, 1965, at a cost of $500,000 Fort Wayne Children’s Zoo, comprising five and one-half acres and 18 exhibits, opened to the public. In 1969, Director Earl Wells established the Zoo Mobile program, which visited every third grade classroom in Allen County. By 1982 there were about 550 animals in the zoo, with 12 permanent staff and 50 seasonal workers. Nearly 100 volunteers helped where needed. The opening of the Australian Adventure in 1987 was the crowning event of the year. The zoo broke all attendance records, and received a prestigious award from the professional zoo community. The African Journey’s grand opening in 2009 brought unprecedented publicity to the zoo. Parents magazine named the zoo one of the nation’s “Top Ten Zoos for Kids.” More than 613,000 people visited the zoo in 2009, far out­pacing the previous record of 540,000 guests in 1994. 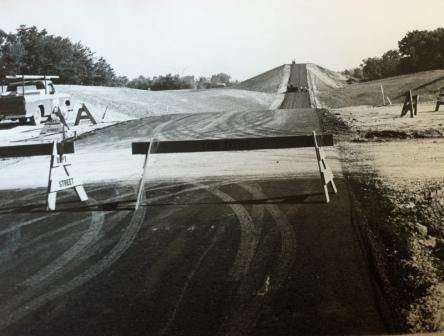 Ground was broken on March 24, 1969 by Tom Chapman, the secretary of Fort Wayne Soap Box Derby, Inc. The first Soap Box Derby was held on July 20, 1969. The competition was available to boys 11-15 years of age. Sixty cars competed for a $500.00 savings bond and a paid vacation for a week to the Derby Downs, Ohio. The winner then went on to compete for a $7,500.00 college scholarship. Just a few years later in 1974 prizes included trophies, Magnavox Color TV, Magnavox black and white TV, radios, t-shirts, and a watch. In 1992 the last Soap Box Derby was held. In 1994 the BMX track was moved from Rockhill Park to Franke Park which took place of the Soap Box Derby Track. Currently events are held seasonally at the track. For more information about BMX go to the Franke Park BMX Facebook page.